Tickets orginally said 7:45pm start time but this has since been changed to 8pm start. There may be pat downs, security wanding, and a full bag search on entry so to keep it simple, check out our conditions of entry. All bags larger than 30cmx30cm will need to be left at our external bag check area for the duration of the concert. As per tour security requirements bottles of any kind are not allowed into the venue for this show. We have a range of drinks for sale and free water stations available on both levels of the arena to keep you hydrated. 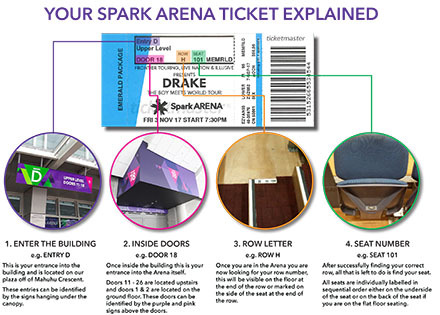 If you are on the seated floor, you are going to want to head to Entry G (Entry C will no longer be opened) when you arrive - check what it says on the top part of your ticket. For access to tiered seating, head to Entry D & E and then straight up the stairs once you are inside the arena to get to your seats - your allocated seat number is printed on your ticket. Entry B is our mobility access entrance which you are welcome to use if needed, regardless of which door is printed on your ticket. You may bring a small, pocket-sized, digital or instamatic camera to the show however, please ensure your FLASH is turned off! Inside the arena, the merchandise outlet by Door 20 (upstairs, to the right) will be open once doors open at 7pm.